The Athenians dedicated the bronze date-palm, with the gilded statue of Athene beside it, from the two successes on the same day at the Eurymedon, with their infantry on land and their fleet on the river. I noticed that the gold had been damaged on part of this statue, and put it down to thieves and vandals, but Kleitodemos, the most ancient of the local historians of Athens, says in his book on Attica that when the Athenians were getting ready the expedition to Sicily, an enormous flock of crows descended on Delphi and chipped at this statue and tore off the gold with their beaks. He says the crows broke off the spear and the owls and the fruit that was on the tree like a harvest. Kleitodemos gives other portents as well which forbade the Athenians to sail for Sicily. Pausanius, Guide to Greece, volume 1: Central Greece, p. 445 (trans. Peter Levi). Go to Tales of the Oak and read about Mount Crow, a corner of old Greenock associated with witches, hangings, and crows. I think the hill the same one later occupied by the Grosvenor Sports Club. Morton host Ayr United. This is their second meeting of the season. The first ended in a 2 - 1 win for the Honest Men. Entering today's play Ayr are in sixth place with 14 points, Morton in seventh with 12 and a game in hand. Morton's three wins came at the expense of Dunfermline, Raith and QoS. The latter two are in the top half of the division. Ayr's four wins have been against Morton, Hibs, Dumbarton and QoS, two of which are in the top half. Which goes to show that anyone can beat anyone in the Championship. Morton have not lost at Cappielow since March 26th. 1898-99. After having hosted Linthouse FC the previous week, Morton travelled to their park in Govan, and won 0 - 1. The Atlantic League. This summer UEFA announced changes to future Champions League competitions that would increase the presence of top clubs from Spain, Italy, Germany and England, and squeeze out the champions of the smaller European countries. In reaction to this plan, top clubs from Sweden, Norway, Denmark, the Netherlands and Scotland have started to formulate an Atlantic League. It seems that these clubs would not quit the Champions League, but rather their own domestic leagues, and form a sort of Premiership for northeastern Europe. The upshot for Scotland would be that Celtic and Rangers would quit the SPFL, and probably only participate in the Scottish Cup, where no doubt they would whine for a bye into the quarter-finals, based on the superiority of the Atlantic League to the Scottish Premiership. The advantage for a ten-team Scottish Premiership without Celtic or Rangers would be that the title would suddenly be within the grasp of any number of clubs. How is the Swiss Challenge League like the Scottish Championship? Like the Championship, the Challenge League plays through the winter. Both play a 36-game schedule. But there are no playoffs. There are no reserve teams. The greatest travel distance as the crow flies is 262 km, from Geneva to Wil. Average stadium capacity is 11,774. Average club age is 102. "Scottish footballers" is one of Wikipedia's "Very large categories", and contains 6,156 pages. NTV Beleza have won the cup 11 times and will probably be in the final. Club Fields Linda are from Sapporo and are the female affiliate of Club Fields Norbritz. They wear orange and blue. What is football? Football is any game involving a foot and a ball. Kicking a ball around has been codified into any number of sports, one of which is association football. Greenock Morton play association football and are part of the Scottish Professional Football League. They call what they do football or fitba. In England they will tell you that the name of association football is football and not soccer, though both football and soccer are nicknames for association football, and both nicknames were coined in England. In England they will tell you that everyone in the world calls the sport football or a variant of that, like Fußball (Germany) or futebol (Brazil). But in Iceland they say knattspyrna, and in Slovenia they say nogomet, and in Italy they say calcio. And in the United States, Canada, Australia and the Republic of Ireland they say soccer, because football is a different sport. Mount Crow decrowed. Lawn bowling is played with balls, but not feet, so it's not football. Source. Match 62: Montedio Yamagata v Kyoto Sanga FC. As of last weekend Montedio Yamagata stand 17th in the 18-team J-League Division 1 and mathematically they cannot avoid relegation. Kyoto Sanga are 8th in Division 2, but they won the Emperor's Cup in 2002. Match 65: Gamba Osaka v Mito Hollyhock. Gamba Osaka are 2nd in J1. They won the Emperor's Cup in 1990, 2008 and 2009, the first time as amateurs. Mito Hollyhock, whom I may just have decided have my favourite Japanese club name, sit 16th in J2. Both clubs wear blue and black stripes. Match 67: Sanfrecce Hiroshima v Ehime FC. Sanfrecce Hiroshima were one of the eight original clubs of the JSL, playing under the corporate name Toyo Industries. They were JSL champions five of the league's first six years, and won the Emperor's Cup in 1965, 1967, and 1969. Ehime are 15th in J2. Match 69: Cerezo Osaka v Fagiano Okayama. Cerezo Osaka were another original JSL club, known as Yanmar Diesel back then. They won the Emperor's Cup in 1968, 1970 and 1974. Currently they're 11th in J1. Fagiano Okayama stand 14th in J2. Match 70: Vegalta Sendai v Avispa Fukuoka. It's North versus South. Vegalta Sendai from Tohoku are 8th in J1. Avispa Fukuoka from the island of Kyushu are 16th. Did they teach us anything at school? Here am I, far enough over the brow of the hill that I can see on all directions, and I'm only just finding out about Yatagarasu, the three-legged crow, who was sent in a sun disc by Amaterasu to guide the Emperor Jimmu to Yamato around 600 BC. There are Shinto shrines devoted to Yatagarasu, where you can hang ema addressed to Yatagarasu, or purchase omamori to carry around for good luck. Yatagarasu has been adopted is the symbol of the Japan Football Association, the Japanese national football team, and the Emperor's Cup, the Japanese equivalent of the FA Cup, so presumably there are all sorts of people petitoning this three-legged kami on behalf of their local club, though how these conflicting requests are sorted out I do not know. Ilha do Corvo is the northernmost member of the Azores, the mid-Atlantic archipelago stretching west from Portugal. It is home to four or five hundred people, some stone windmills, a huge extinct volcano, and, to judge by the name, crows. Corvo and its hydrangea-speckled neighbour Flores are so far out from the European mainland that they actually rest on the North American Plate. Consequently they are edging away from the rest of the country by several millimetres each year. Already Corvo is a few miles closer to St.John's, Newfoundland, than to Lisbon. December gift giving folly is a long way off I suppose. 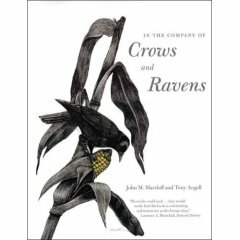 But is it really so far away that I can't hint that this might be a nice addition to the oddly growing pile of crow-related reading material? I'm still on the look-out for this one, but I don't need this one or this one.